Kawau’s beautiful waters, green and rocky interior and position just off the coast made it a covetable spot for Maori tribes and it was a hotly contested piece of land. Under European ownership the island was briefly a copper mining community before being bought in 1862 by Sir George Grey, the Governor of New Zealand, who used it as a wonderful private paradise, which is what it can be for you now. The best places to stay in Kawau Island are quiet spots on the beautiful coastline, with views both inland and out to sea. The island’s main sight is Mansion House, Governor Grey’s house. This has been restored to its original wooden glory, and inside there’s a fine collection of Victorian antiques and collectables. Grey used the land around his house to create a tropical botanical garden with a variety of different species of plants making it both an interesting and tranquil experience. The garden also has a few different species of wildlife including peacocks roaming the grounds. Spot the island’s natural inhabitants including Kiwi and the rare North Island Weka. Step back in history with a visit to the ruins of the old copper mine dating back to the 1800's. A few of the original buildings still remain. 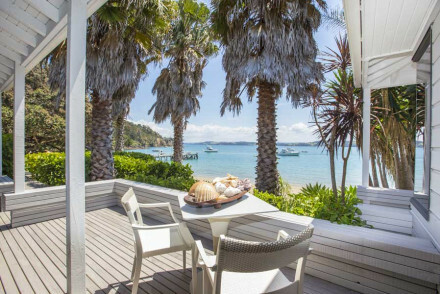 Our pick of the best places to stay in Kawau Island are both situated on the north end of the island and both have wonderful views. They offer a perfect spot for some R&R on your tour of New Zealand. 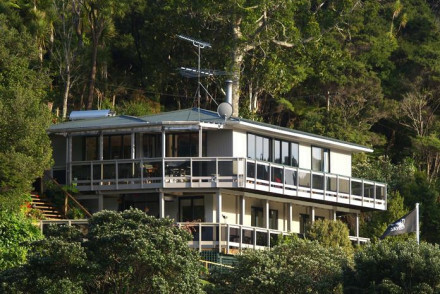 Kawau Lodge is an eco-lodge on the north cove of the island, with just three rooms, a balcony running all the way around the property and spectacular views of both the ocean and the forest. You also have direct access to the beach and wonderful home cooked meals. The Beach House is a luxurious hotel with 11 rooms, opening out onto the beach, onto the bush, or onto a lovely courtyard. There’s a good range of public space, including lovely sun decks with plenty of private feeling nooks and a great restaurant. If you'd prefer your own space, don't hesitate to visit our online partner Booking.com for a range of apartments to suit the requirements of all visitors. Fly to Auckland Airport located about 90km (55 miles) from Sandspit. The airport serves a substantial number of international and domestic connections. Catch a ferry or water taxi from Sandspit to Kawau Island, with regular daily services. If you want to rent a car to explore the beautiful New Zealand scenery - for prices visit our online partner Rentalcars. Best time to visit - the summer from December to February provides the warmest weather, ideal for exploring the beautiful island. Alternatively you can extend your search and check out all our North Island recommendations.